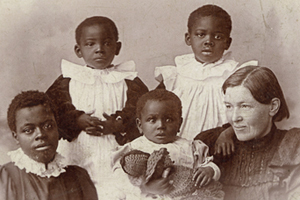 When Mary Slessor arrived in Calabar (modern Nigeria) in August, 1876, the average life expectancy of an African missionary was just a few years. Any who survived and returned home were usually plagued with recurring ill health for the remainder of their lives. Mary, however, was to spend nearly forty years on the African mission field. Born in 1848 in Aberdeen, Scotland, Mary was one of seven children, only four of whom survived childhood. As a child Mary endured hunger, poverty and an alcoholic, abusive father. Mary’s mother was a Christian and laid the early foundations of faith in her children and ensured they received a basic education. After the family moved to Dundee, Mary, at age 11, became a mill weaver, working during the day and attending school at night. She dreamed of one day becoming a missionary like her hero Dr. David Livingstone. “You’re only a girl”, her older brother Robert scoffed, “I will be the missionary in this family.” Robert did in fact become a missionary, to New Zealand, and died there only a few years later. In August 1876 Mary realised her dream and sailed for Calabar, a British colony in West Africa. Initially she was assigned to the mission compound in the coastal settlement of Old Town, but her heart longed to reach the natives further inland living in the deep jungle where no missionary had ever set foot. Besides, Mary didn’t fit well with the other missionaries, choosing to live as the natives did, abandoning her petticoats and shoes, cutting off her long thick hair, eating native food, climbing trees for coconuts, and generally displaying behaviour frowned upon among missionary society. Eventually, after twelve years on the coast, Mary was given permission by her Mission Board to open a mission station inland among the fierce Okoyong people. One of the local customs that Mary fought hard against was the murder of twin babies. The Okoyong believed twins were sent by an evil spirit and routinely killed twins at birth or abandoned them in the jungle, also murdering their mother. One day an abandoned twin was brought to Mary, who took the child in as her own. This began a long ‘twin rescuing’ ministry which eventually saw Mary raising several native children. As a result of her tireless efforts, the practice of murdering twins was eventually abandoned entirely by the tribes she worked with. Another practice Mary challenged among the Okoyong was human sacrifice. At the death of a chief, a large pit would be dug for his burial and his wives, children, and slaves would be buried alive with him. Mary often put her own safety at risk to stand against this custom, rebuking shamans and warriors for their disregard of human life and telling them there was another way to live: through the gospel. Physically Mary was a tiny woman but her bravery and commitment to their welfare witnessed to the Okoyong of her deep love for them, which in turn gained her great authority and respect among them. Mary was called on regularly to settle tribal disputes. On one occasion when two cannibal tribes went to battle she ran ahead of the warriors, placing herself between the two warring parties who menaced her with spears. She argued back and forth with the two leaders until they gave up their fight. Events like this were not uncommon in Mary’s jungle life. She believed thoroughly that God had brought her to Calabar and God would therefore protect her. After furlough in Scotland in 1891, and having established the gospel among the Okoyong, Mary returned to Calabar with a desire to push even further inland to reach cannibal tribes who had not yet heard the gospel. She opened a station at an old slave market site called Itu, later also adding a hospital. Tribes from the surrounding districts, when they heard of Mary’s arrival, sent word for her to come and bring her gospel message among them also. An issue Mary worked very hard to change was the status of women among the tribespeople. Women were regarded as little more than animals and treated accordingly. Throughout her life Mary battled hard to change this attitude, among other things establishing a home for native women and girls where they received training in trades that could make them self-sufficient. A few days later Mary Slessor, servant of God, died and was buried among the people she loved. *From Ten Girls Who Became Famous by Basil Miller. Grand Rapids, MI: Zondervan, ©1946. wonderful! we read these books to our eldest daughter (youngest don’t sit still for long enough!) to inspire her and at 17 she still mentions them……..
Mary Slessor is one of my favourite heroes of the faith. I’m glad you like her too!